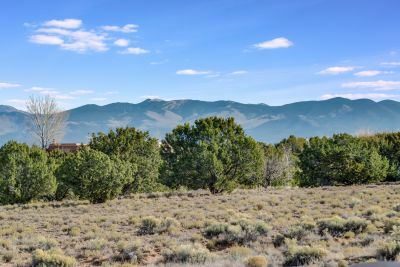 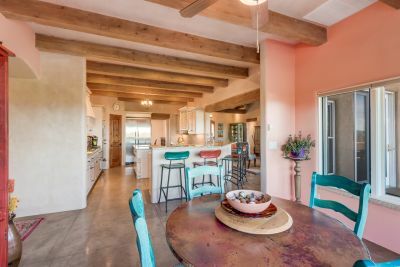 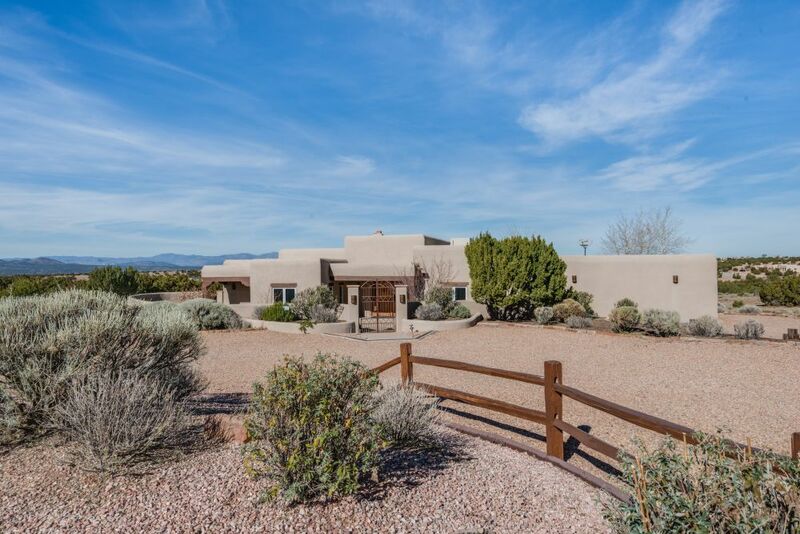 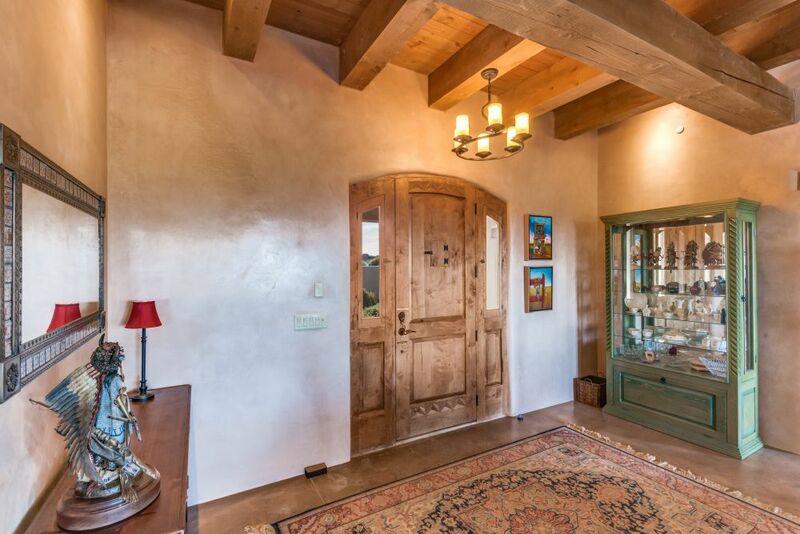 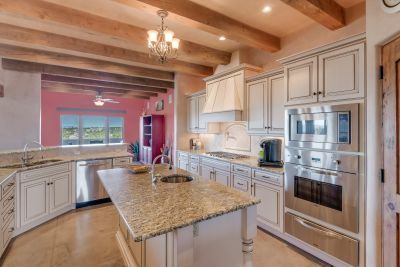 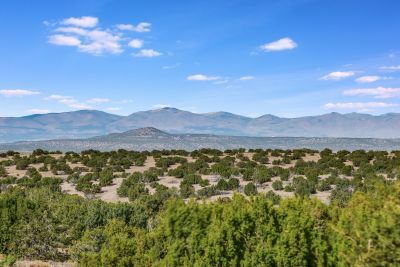 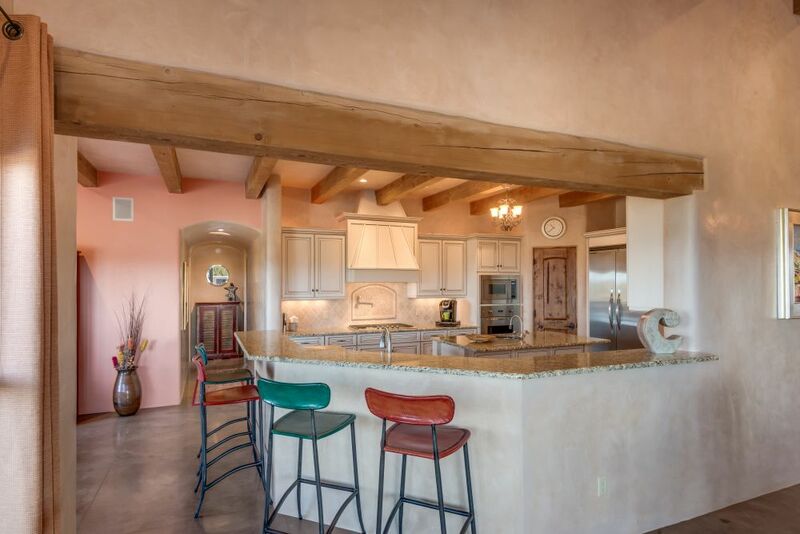 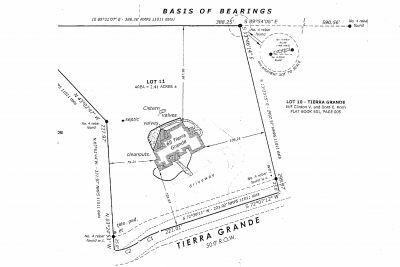 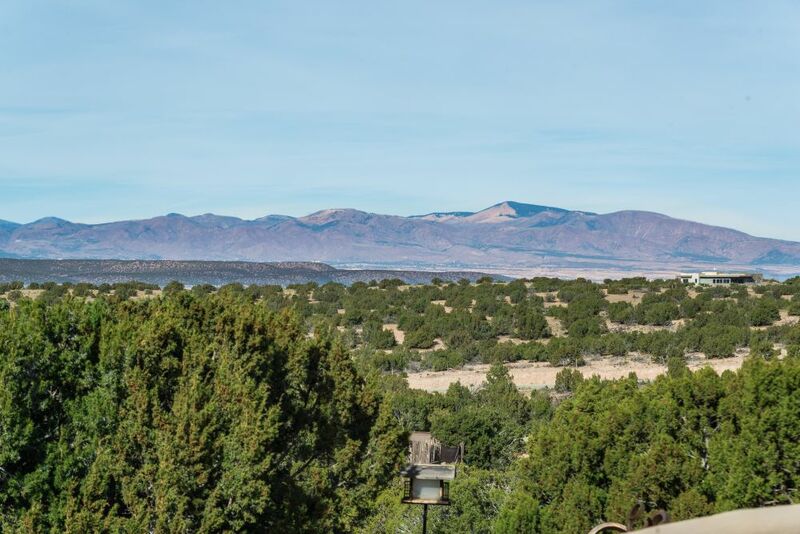 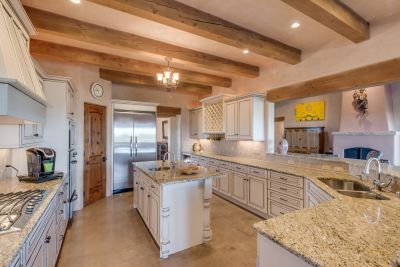 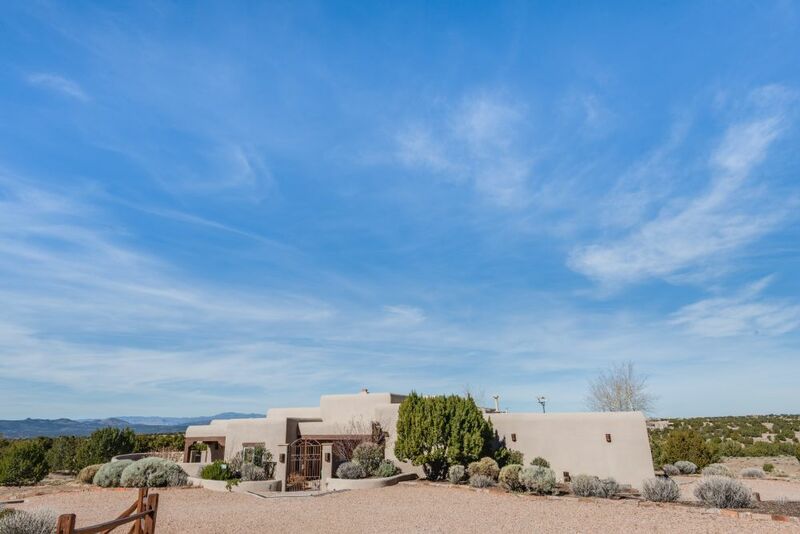 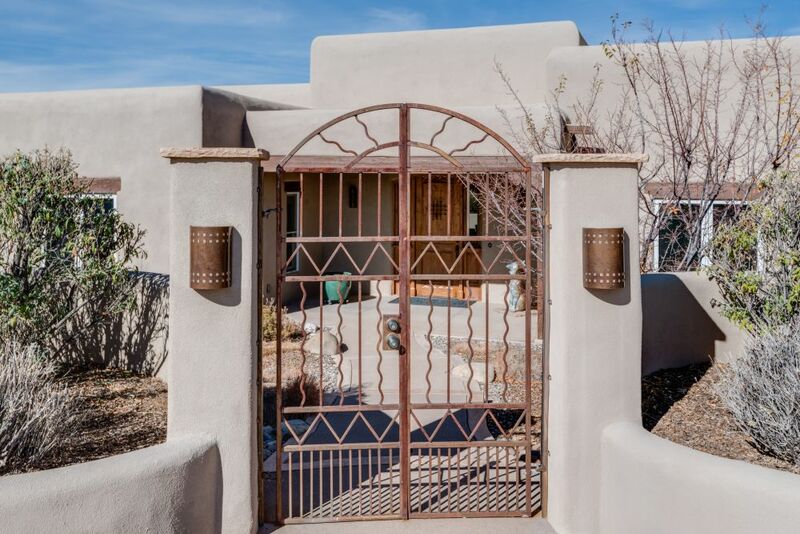 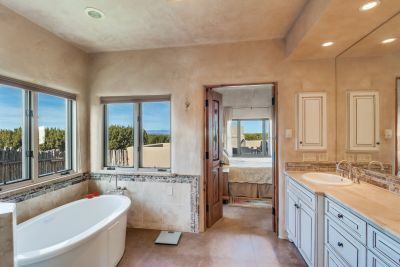 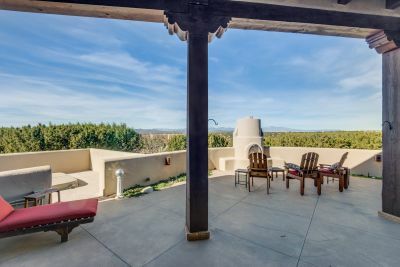 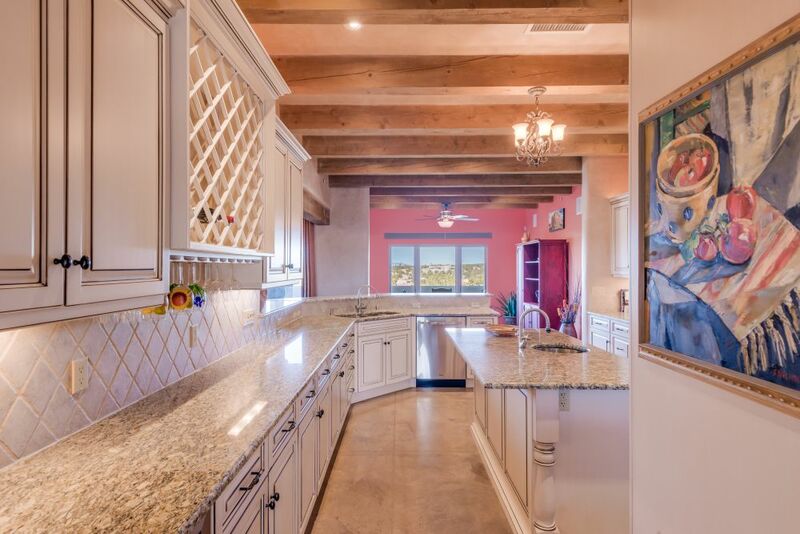 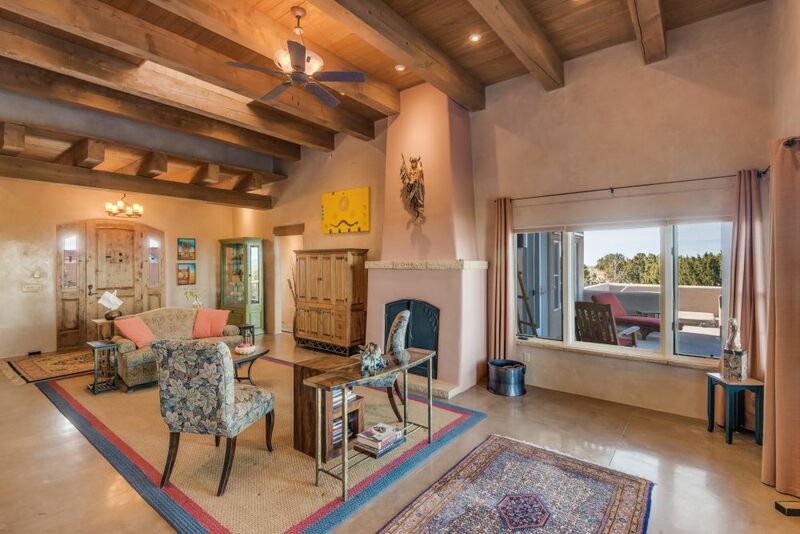 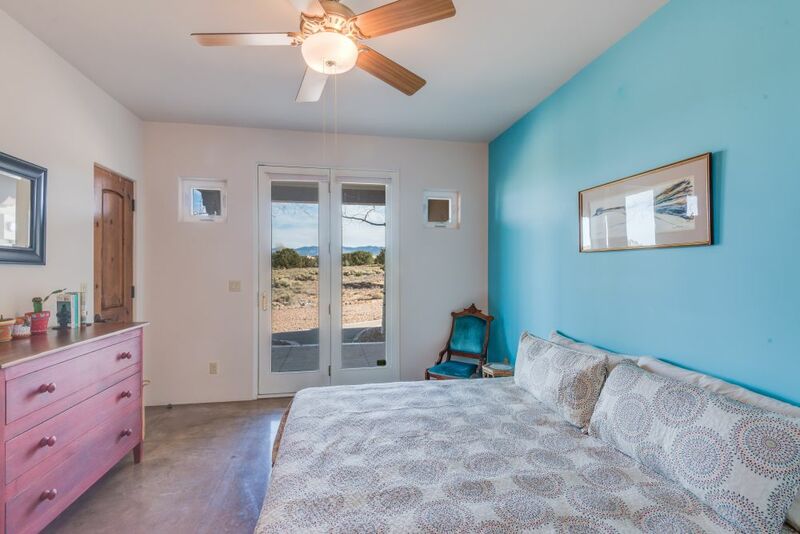 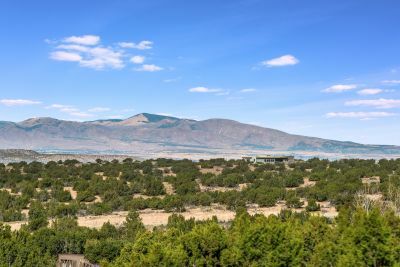 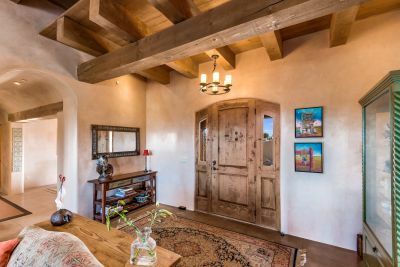 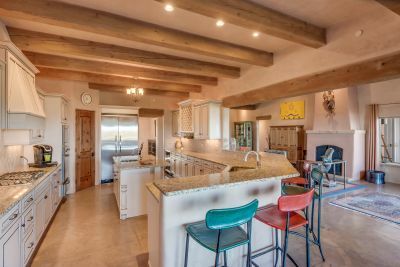 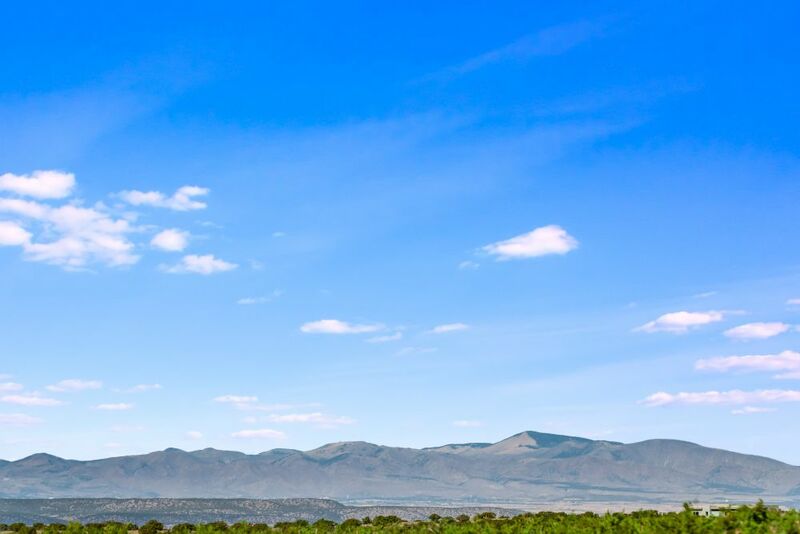 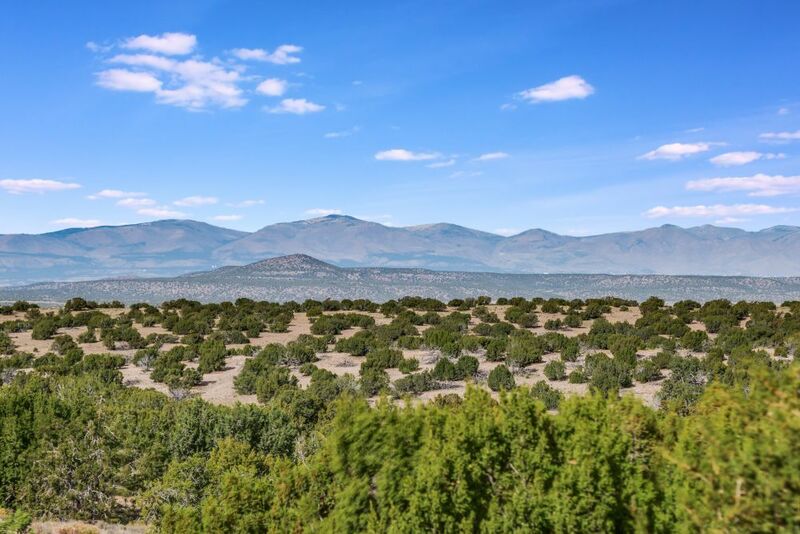 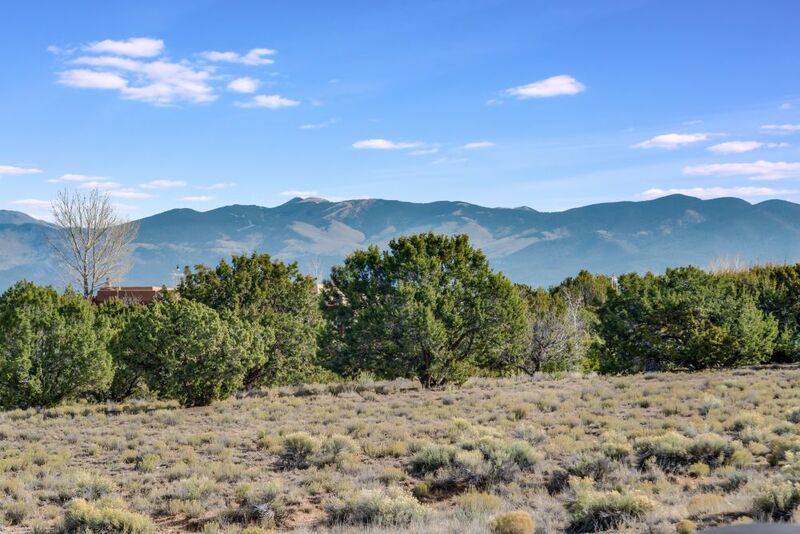 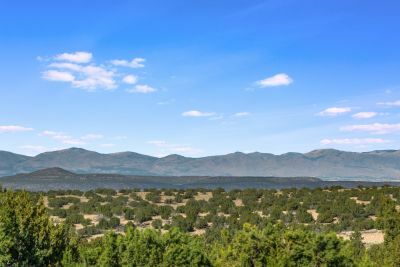 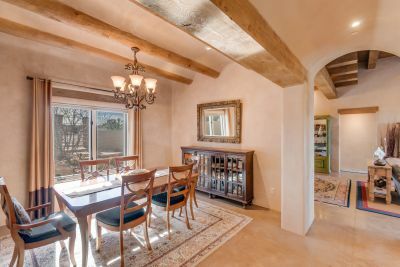 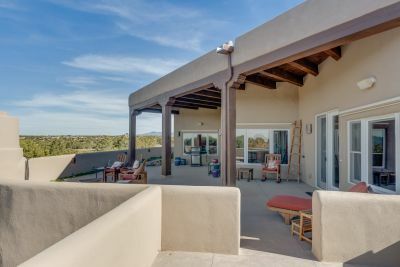 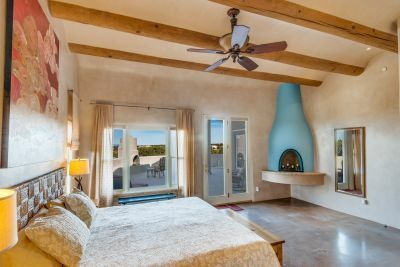 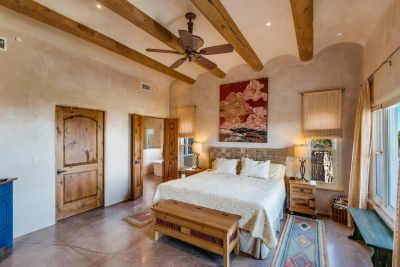 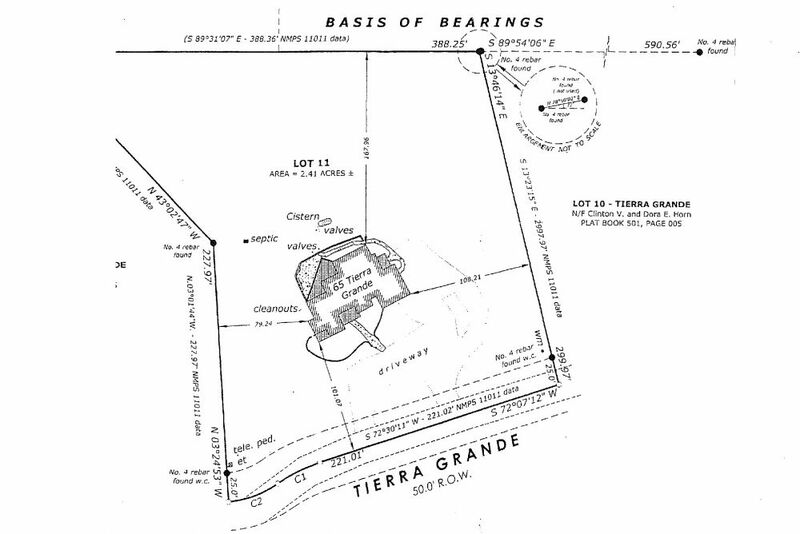 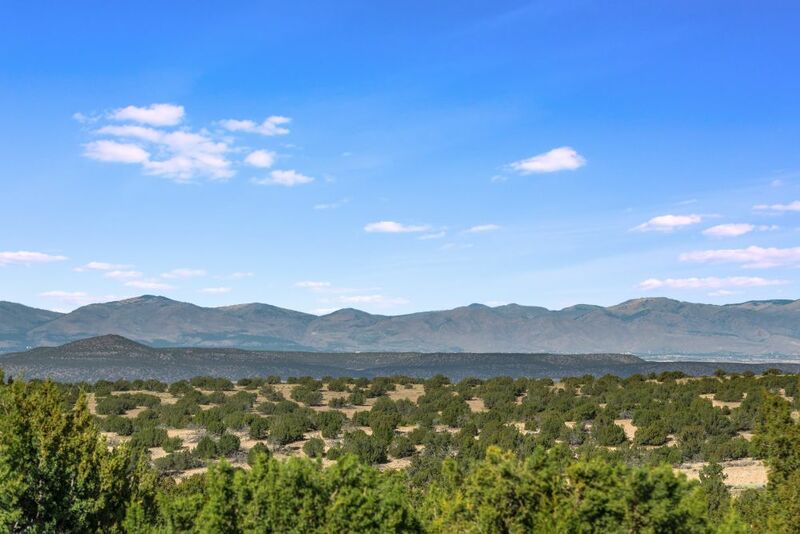 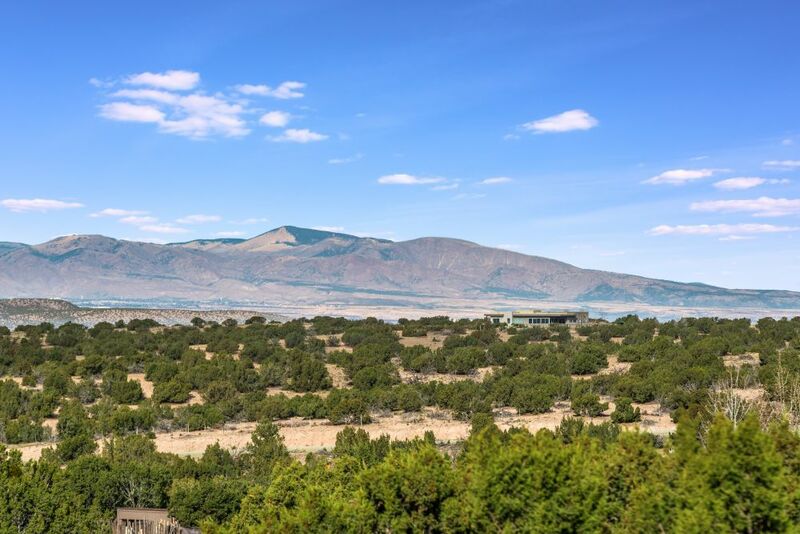 This marvelous residence is sited on an exceptional lot with spectacular views of the Jemez Mountains and Sangre de Cristos. Set well back from the road with a generous motor court and circular drive, this entirely one level home is special indeed. 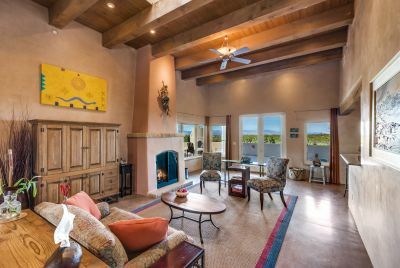 The expansive living room has soaring beamed ceilings, a handsome fireplace with gas starter, and a delightful dining bar. 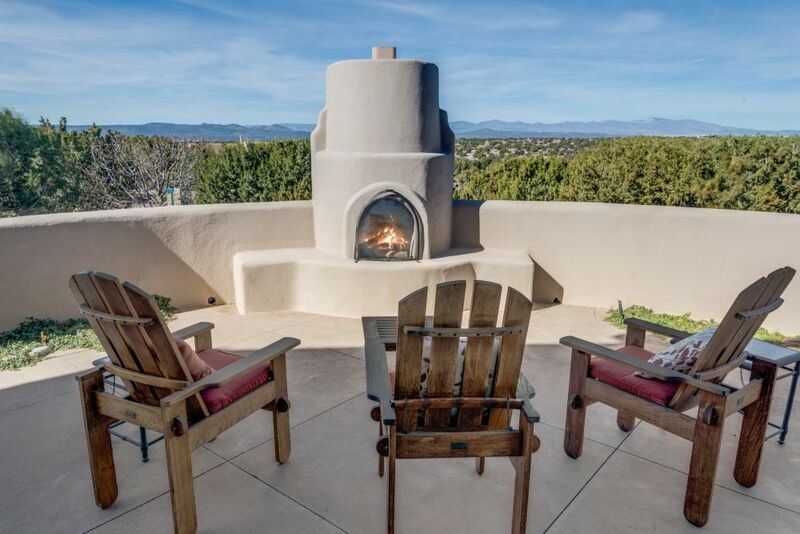 It accesses the deep entertaining portal and spacious walled terrace with fireplace, and a separate spa area. The open floor plan, including a sensational Viking-equipped center island kitchen with breakfast bar, breakfast room, and a lovely adjacent dining room, makes cooking and entertaining an absolute joy. 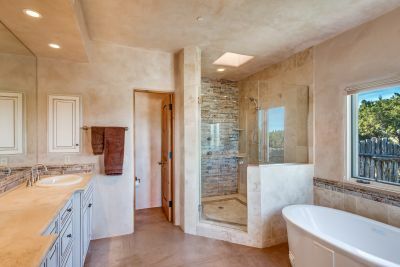 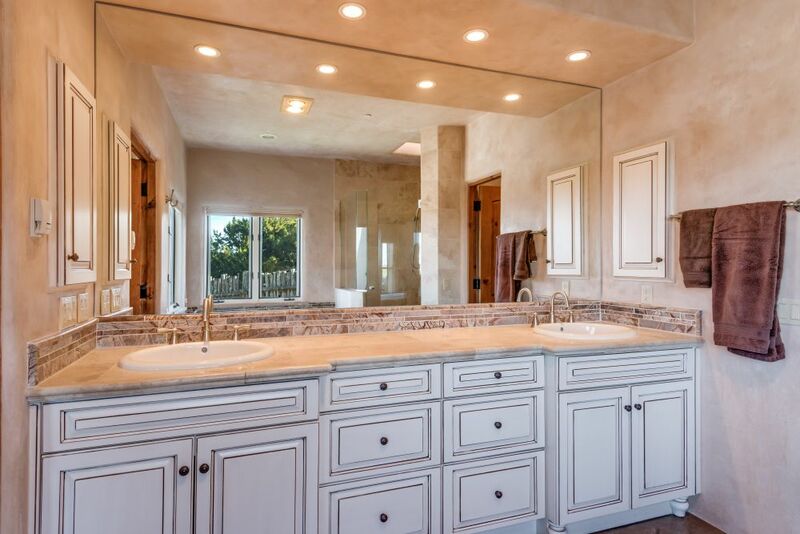 The private, elegant master features high coved ceilings with vigas, a raised kiva fireplace, fitted walk-in closet, a lavishly customized bath, and accesses the portal and sunken spa. 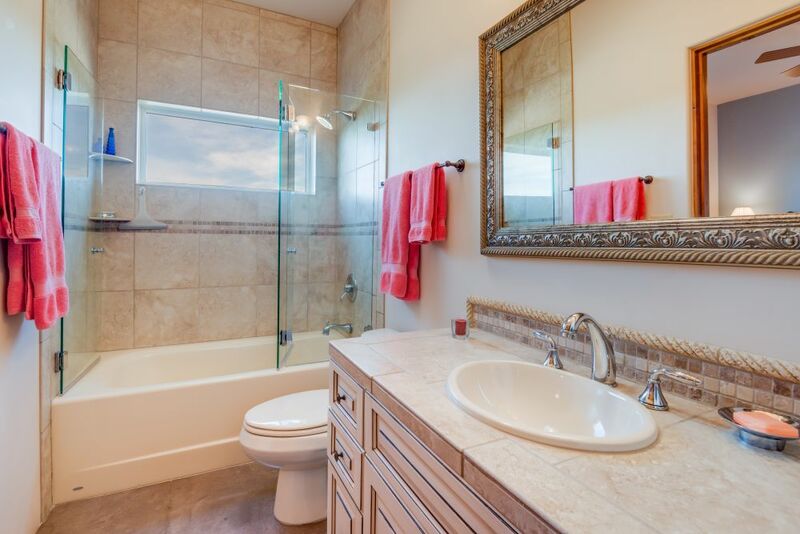 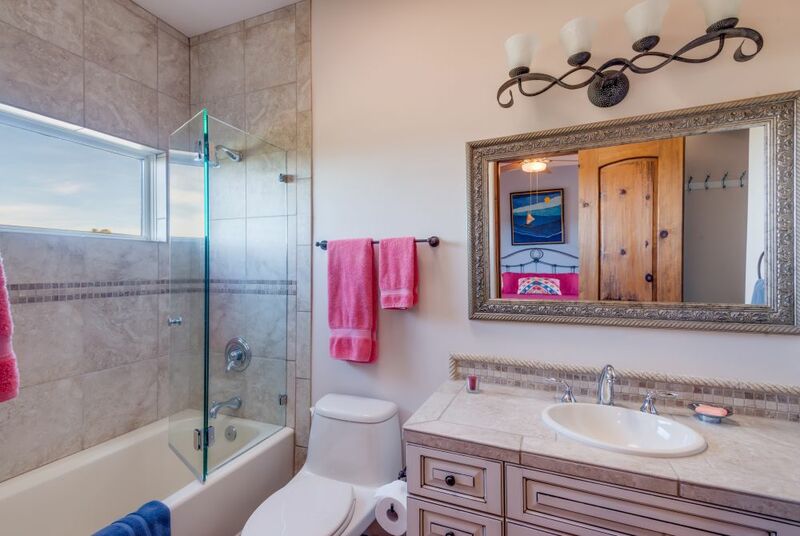 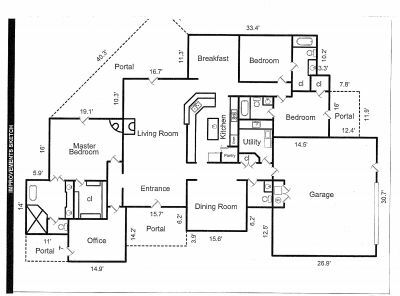 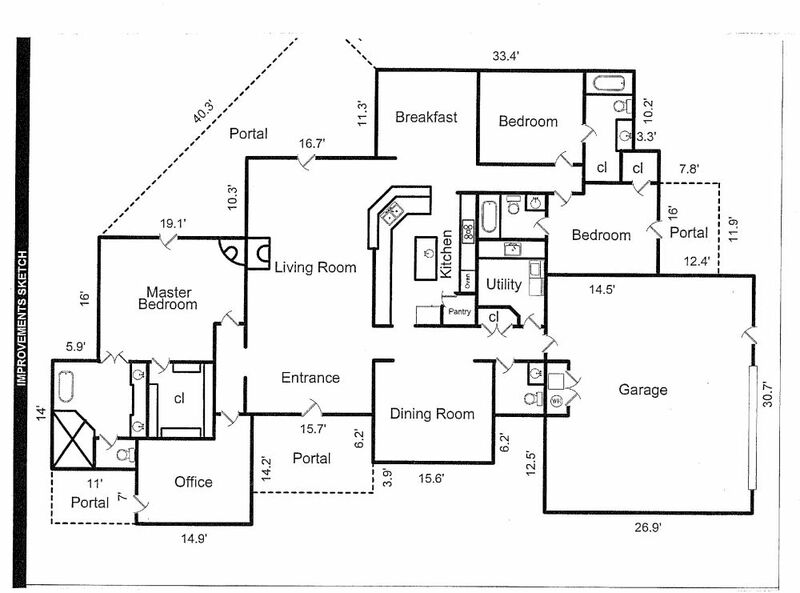 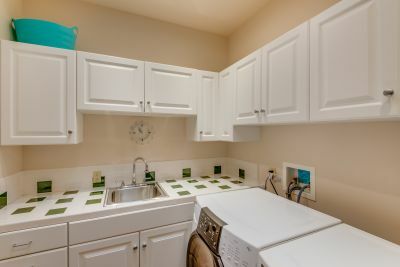 A separate guest wing has two bedrooms, each with a full en suite bath, and a separate powder room. 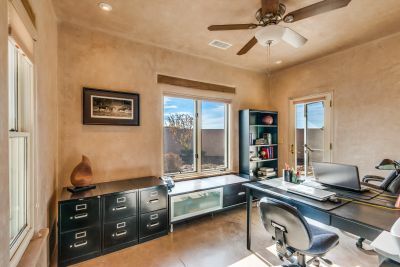 A separate private office also has outdoor access. 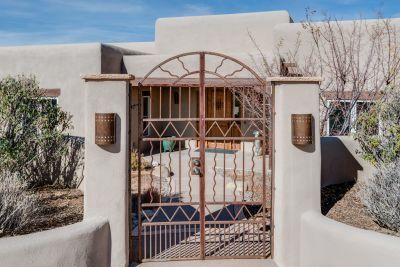 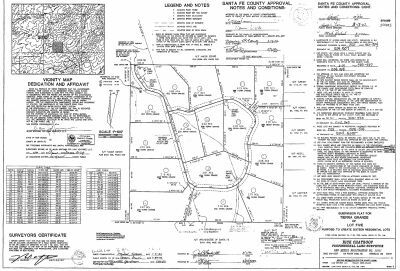 The large, landscaped front walled garden includes a beautiful iron gate, a stone water feature, and access to a high coyote-fenced dog run with artificial turf. 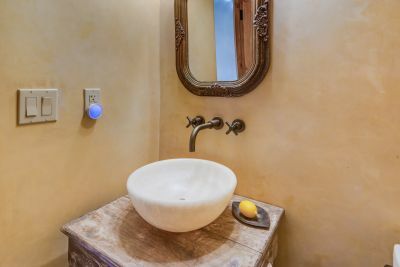 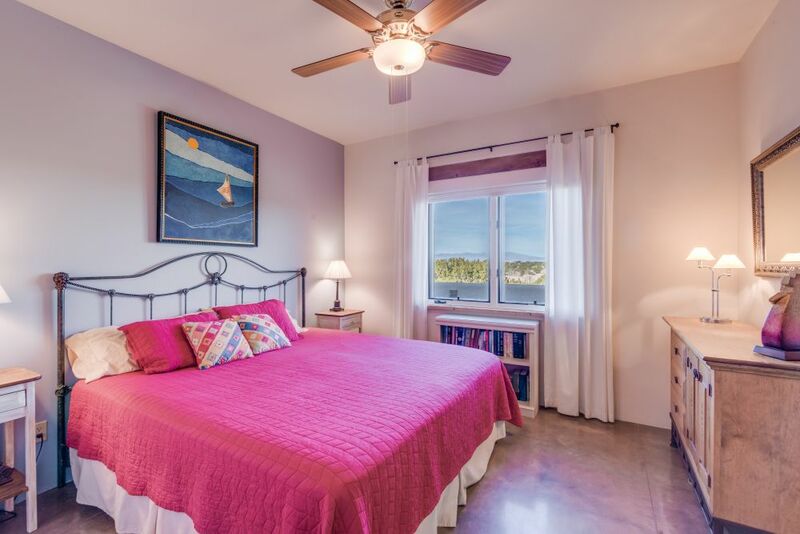 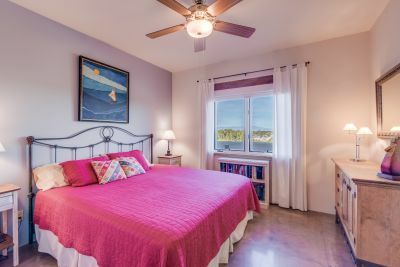 Luxury details include luscious pigmented hand trowel plaster walls and ceilings, finely custom-crafted doors, a built in speaker system, both in-floor radiant and forced air heating systems, and central refrigerated A/C.